High Definition 3D Performance & Image Quality to Your PC! Step-up to serious 3D performance and high-definition image quality with HIS X1300 Series. For enhanced graphics, the HIS X1300 Series combines a 90-nanometer process GPU, a new ultra-threaded 3D processing architecture, optimized for Shader Model 3.0 to deliver new high dynamic range visual effects, enhanced adaptive anti-aliasing realism and lightening fast performance. Plus an advanced memory controller with high speed DDR2 memory. The HIS X1300 Series is a great upgrade from discrete graphics because it gives your customers state-of-art graphics technology at an affordable price point. With ATI's Avivoℿtechnology the HIS X1300 Series connects to home entertainment devices and allows you to view your digital media and play games with vibrant colors, sharp images, true-to-life image reproduction, and the smoothest video playback ever offered by ATI. 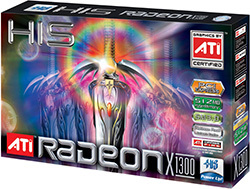 I have this as my graphics card and it is called the x1300/1500series. Works great! I use this in a DELL Dimension E310 or sometimes it is called a 3100. I works OK, because this Dell only has a X1 slot for the PCI Express slots, no X16 etc. This is a great card for having multiple monitors as it supports both VGA and DVI connections. This is a good card for Audio/Video and office use. 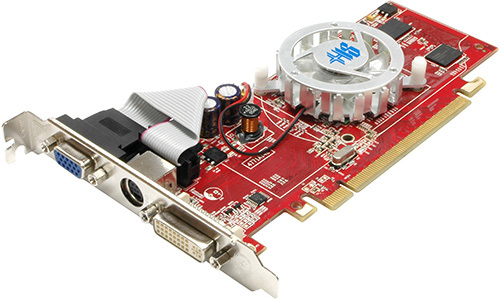 [HEXUS Essentials Innovation] Recommended if you need graphics output from a x1 PCIe slot, then. [Great Value] It is still excellent for a low-profile Home Theater PC for watching movies or for playing the odd game. [So-So Product] The extra 256MB of memory on this card helps out a little when running higher quality settings.